Software alone is a painful way to VJ, without something to trigger and control clips and effects. 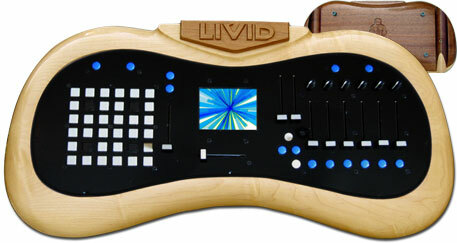 Livid’s Tactic hardware had the right idea, with buttons for clips, faders and knobs for layering and effects, and even a built-in LCD — plus a lovely polished-wood case. (No cheap plastic here.) But it also had a steep price. The revised m2 takes a big price cut and includes new Tactic Pro software, all for US$899. That’s about the most impressive bundle I’ve seen; now I want to get my hands on the controls and see how they feel. Sure, Livid overstates how this replaces hardware. (Check that picture; how exactly does the Tactic fill in for a high-end DV camera?) But this does reduce the barrier to entry, at a price that, for hardware-centric solutions, would only buy you a simple video mixer. And it’s nice to see “next-generation” meaning lower prices, too. Don’t miss their updated Union 1.5 software, too, which I know at least a couple of you out there are using. Let us know how it goes. And yes, these are the same people that brought us the Viditar, the Keytar of the VJ world.